After an intense bidding war, television network FOX has landed the rights to Gotham, a new series from Warner Bros. TV and The Mentalist creator Bruno Heller. Gotham will tell the origin stories of James Gordon and Gotham City’s most popular villains. 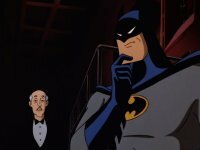 Gordon is still only a detective in the TV series and hasn’t met Batman yet. In fact, Batman will not be part of the show at all. No word yet on when the show will premiere or who will play Gordon, but stay tuned to Batman News for all the latest!